Is your baby a Baby Sign Language Baby? From the time my son was 9 months old I've been using sign language as a form of communication. Is your baby a Baby Sign Language Baby? Teaching Baby Sign Language to infants and toddlers between the ages of 6 months to 36 months assists parents in positive communication with their children. Wouldn't you agree when you can communicate clearly, a conversation is more beneficial? Conversations that are one-sided can be frustrating for both baby and parent. An infant cannot speak the words so the parent doesn't understand the needs of their baby. When toddlers are just beginning to talk, the words just don't come out clearly. Baby Sign language can bridge the gap, and boost psychological and emotional development. Baby Sign Language helps keep noise levels down by reducing frustrated screaming and crying. Baby Sign Language reduces the 'guesswork' in meeting each child's needs resulting in more available time for positive, developmental interactions. Baby Sign Language minimizes stress and frustration for parents & caregivers who are meeting the needs of many children at once. A recent study shows that signing significantly reduces problems with biting that most parents have. Children bite because they are frustrated in their environment causing them to lash out in nonconstructive ways. During meal time confusion can be greatly reduced just by knowing understanding what your child wants. When a child can sign "cracker, milk, apple, etc." it is very exciting for a baby or toddler and it boosts their confidence. It's not just about getting the snack or meal they desire, it's about them being able to communicate it and receive it. The use of baby sign language gives children with special needs the opportunity to meaningfully interact with regular developing children. General acceptance of children with special needs is more acceptable to other children when they can communicate together. Be one step ahead of the rest, learn sign language. There are tons of useful FREE videos on YouTube as well as some very inexpensive resources for sale right here! Is your baby a Baby Sign Language Baby? Do you teach your baby Sign Language? Even a monkey could do it. 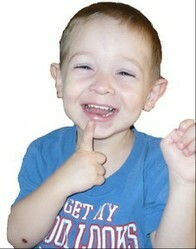 Research shows that learning and teaching baby sign language builds confidence and enthusiasm for higher learning. Reading the 3-D language of sign also develops visual skills for reading printed language later on in school. By the time by son was a little over two, he knew all his colors, numbers 1-10, the entire alphabet and he has just begun reading three-letter words. I'm not bragging (ok, maybe a little) but he's proof that a baby sign language baby is more developed mentally and educationally speaking. It really opens the doors of communication when they are not able to verbalize their needs. When I was a parent educator, I used to encourage parents to teach sign language before the age of 1. It really does ease a child's frustration during those months when he/she can understand words but is not yet able to make clear sounds. It also helps parents tune in to what a child may be thinking. Even a few useful words, such as "more," "hungry," and "tired" can make a huge difference. The child gets to experience the joys of connecting. This can increase motivation to speak. Not long ago, I saw a parent signing with her infant in a restaurant. The baby couldn't have been more than about 9 months old, and he was grinning from ear to ear. I taught my babies a few signs. It's a great way to communicate with a preverbal child! I remember seeing a news report about babies learning faster by learning sign language. How cool is that! Super interesting! Such a great idea to teach babies sign language! Are you planning on learning how to speak Italian? If you are, you may be interested in learning more about the origins of modern standard Italian.